Soft buttery dough is the secret to these sweet teatime treats. These cinnamon rolls have a vanilla filling with a maple syrup and whisky glaze. Equipment and preparation: you will need a mixer fitted with a dough hook. To make the dough place the flour, sugar, salt and yeast into a mixer fitted with a dough hook and slowly mix in 450ml/16fl oz water, adding more or less as needed, until the dough starts sticking to the edge of the mixing bowl and feels elastic. Cover the bowl with a clean tea towel and let the dough rise for about 20 minutes, or until it doubles in size. When the dough has risen, knock the air out of it and roll out onto a floured surface into a rectangular shape measuring 60x30cm/24x12in. Slice the butter into rectangles about 1cm/½in thick and lay in two strips covering half of the dough. Fold the dough over and press down lightly at the edges to seal. On a well-floured surface beat the dough with the rolling pin then roll into a 60x30cm/24x12in rectangle again. Fold either end in to meet in the middle, then fold together and repeat the beating, folding and rolling process twice more. Wrap the dough in cling film and leave to rest in the fridge for one hour. Roll the dough out into a rectangle approximately 1cm/½in thick. The rectangle should be 30 x 45cm/12 x 8in long. For the filling, mix together the cream cheese, vanilla seeds and cinnamon in a bowl. Cover the dough with the filling mixture, then roll up from the longer side to form a Swiss roll 45cm/18in long. Cut into nine slices each 5cm/2in long. Grease and line a round 23cm/9in spring form tin. Place the circles around the edge, standing upright, and one in the middle, making sure they are not too tightly packed. Leave to prove for about 40 minutes, or until doubled in size. When you’re ready to bake, brush the dough with egg wash and bake for 45 minutes, or until golden-brown. The rolls will expand and join together. 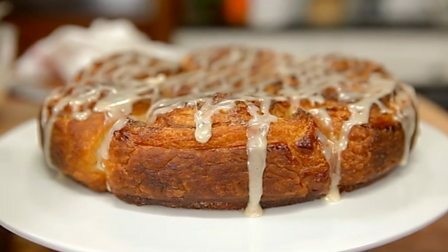 For the glaze, while the rolls are cooling, mix the icing sugar, maple syrup and bourbon together in a bowl until smooth. Lift the rolls out of the tin and put on a serving plate. Drizzle the glaze over the top, back and forth. Tear the rolls apart to separate them and serve warm.